Buttermilk Pancakes - Vegans Eat What? Vegans Eat What? These pancakes taste a lot like those served at a famous pancake house, but without dairy or eggs. Mix the flour, salt baking soda and salt together in a bowl. Add the melted vegan butter, Ener G slurry and soymilk/vinegar mixture and stir to combine. Melt a tablespoon of vegan butter on a griddle or skillet over medium-high heat. Pour a little batter onto the skillet. 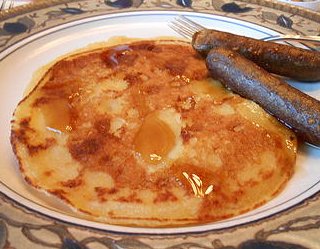 Cook until bubbles appear, then flip the pancake over and cook until browned. Serve with vegan butter if desired and fresh fruit like blueberries or sliced bananas and finish with pure maple syrup drizzled over top. Delicious! If you make extra, freeze some for busy mornings. Just let the pancakes cool completely after cooking, then wrap and freeze. In the morning, pop the pancake(s) in the toaster or oven to reheat.